Hello! This is my first mdx and my first time driving across country (CT to WA). I want to tow a 2015 Nissan Altima (gross weight 4,211). I will be having the atf cooler installed, however, I’m having trouble deciding the trailer that I should use. Dolly or full vechicle tow? I am considering using UHaul not Acura for the tow equipment. Any other towing tips and suggestions are most definitely warranted! Thank you! Check how much the full trailer weighs, then factor in the Altima's weight. You may be able to have it be under the 5000 lb limit. Personally, I prefer the full trailer over a dolly. The dolly might weigh less, but I don't like the idea of having a car's rear tires be wearing down faster since the front tires are on the trailer. The U-Haul people are fairly knowledgeable about towing, so it doesn't hurt talking to them about best practices. Good luck! There is no way to safely tow a 4,211 lbs vehicle with an MDX. However, my research indicates a 2015 Altima only weighs ~3,233 lbs. If you HAVE to use the MDX to tow the Altima, use the dolly and GO SLOW. Hopefully you don't have to go a long distance. If you are going a long distance or have the people/money to manage it, I'd either drive both vehicles, independently, or pay to ship one. We have a 2011 MDX that has the towing package standard and we really like it as a tow vehicle. 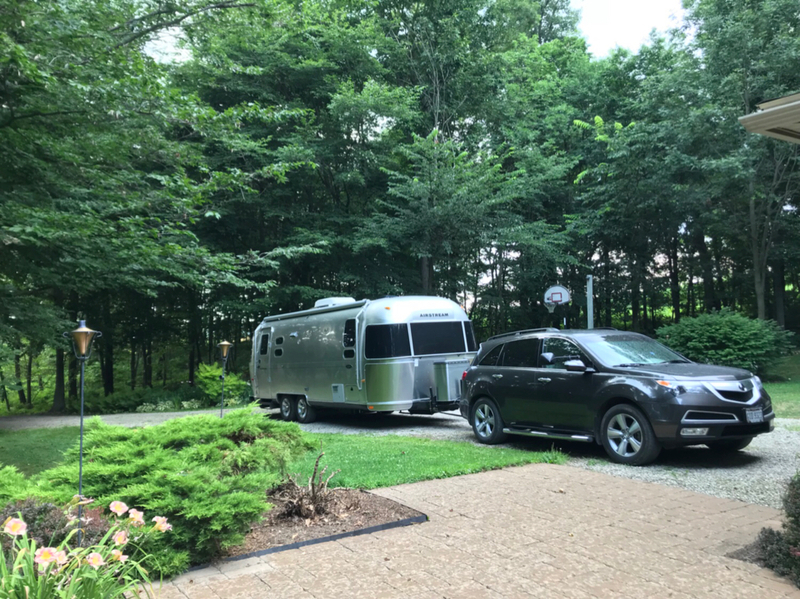 We tow an unbraked utility trailer with 30 bales of hay locally but recently bought an Airstream travel trailer, had reinforcements to our receiving hitch, and have been impressed with the SH-AWD system. You can check out my thread on the Airstream forum under towing. As the other member mentioned, your MDX can tow a max of 5000lbs. The Auto Transport (2210lbs) and Altima (3447) yields a 5657lbs, which exceeds designed tow specs and is not advised. You break anything on the vehicle, your warrenty wont cover it and that transmission cooler is not going to help much either. The dolly (750lbs) and Altima (3447llbs) yields a 4197lbs, which is much better for towing. However, the challenge is to equip the trailered vehicle with lights that hook up to the MDX and are DOT legal. My Advise, rent a F150, rent an Auto Transport, load the altima and have a piece of mind. Make sure that the F150 has trailer harness, a lot of the rental places specifically do not have trailer harness.